Lynn Babineau is a marvelous artist who works at Davis Publications. As a painter, one of her specialties that I admire most is as a miniaturist. Before photography, miniature portraits, usually painted on ivory (I know, I haven’t figured out how they do it either), were very fashionable. Many of the major painters in early American art — Charles Willson Peale, John Singleton Copley, and others — painted miniatures as a way to make money. Having a miniature painted was much cheaper than a full-length portrait. These miniatures were often worn as a locket or brooch to commemorate lost loved ones, or were often mounted in fancy frames. My fascination with miniature painting unearthed a very important early American artist from up New England way. Before the late nineteenth century, women were excluded from official art schools in America. Most women who became professional artists — and there were a surprisingly large number of them — were trained by a father, husband, or other male relative who was an established artist. Some, though, were self-taught. During the first half of the nineteenth century, there were a significant number of women miniaturists and portrait painters. Portrait miniatures were one artistic field in which women could easily succeed professionally since many of them could do the work at home. It also meant that they did not have to study anatomy, considered inappropriate at the time. Sarah Goodridge began to study art by reading a book on drawing and painting. In 1805, she moved to Boston and took drawing lessons. She only attempted the miniature medium after she had worked with a now unknown portrait miniaturist from Hartford. 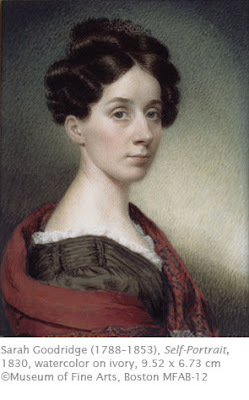 In 1820, she opened a studio in Boston and honed her craft, studying portrait painting with Gilbert Stuart (1755–1828), one of the great American portraitists at the time. She painted a portrait miniature of Stuart in 1827 which he gave to his mother on a woven bracelet made of his and his wife’s hair! She also painted at least 12 miniatures of the fiery orator and US Senator Daniel Webster. This self-portrait displays Goodridge’s characteristic realism in every detail down to the wrinkles around her eyes. The portrait exudes self-confidence. Compared to some other miniaturists, the figure is solidly modeled and the form assuredly delineated, betraying Goodridge’s solid mastery of the human figure. At the time this was painted, she was producing as many as two paintings a week and was able to support her family on her art, an amazing achievement in a period when women were given few opportunities to succeed professionally. Davis Art Images has many lovely miniatures from early America, including a couple by Sarah’s sister, the equally talented Eliza Goodridge. I have a portrait miniature by Eliza Goodridge (Sarah's sister) for sale. See my website www.ArchibaldMiniatures.com for further details. The website also has a blog on miniatures, as well as other information such as reading lists, online museum collection links, etc. All I know about Alice Beckington is that she was one of the founding members of the American Society of Miniature Artists in 1899. There is one of her oil paintings (apparently) at Biltmore House in Asheville,NC, built for Cornelius Vanderbilt in the 1890s, but containing works into the20th century. The painting is a seascape about 14 X 20 inches and is attributed to "Mary" Beckington by one of the guides, but it is probably Alice Beckington. If you contact the curator, they would probably be able to help you. To Jane W.: Thanks for your post about a painting probably by Alice Beckington at the Biltmore House. I will follow up on your suggestion to contact the curator.